A 'KRISHNA PRASADAM' for Aathu Perumal on my Blog Anniversary! Yes, my blog is 7 years old and stepping into the 8th year and nearing 26 lakh hits. Thanks to all for your support. The famous ‘Azhagar Kovil’ or ‘Thirumaliruncholai’, also named as ‘Sri Kallazhagar Perumal Temple’ is located in the outskirts of city Madurai in Tamilnadu. The temple is on the foot hills (Malai adivaaram) of 'Azhagar Malai'. The atmosphere of this temple is so beautiful with cool breeze, surrounded by mountains, thick groves, dense forests, and waterfalls. It is also one of the 108 Divya Desam Temples.The presiding deity of this temple is Lord Kallazhagar (Lord Vishnu). He is Goddess Meenakshi's brother. The Lord is "Sundararajar" popularly known as "Kallazhagar". "Kallar" in tamil means thief. The Perumal is called with this name because He steals His devotees heart by His beauty (Azhagar). He protects all His bhaktas from all evil. The Pushkarani (Temple tank) of Sri Kallazhagar Perumal Temple is called 'Noopuragangai'. This spring is believed to have originated from the anklet of Vishnu. As I said earlier, I have been fascinated by the exclusive prasadams in Vaishnavite temples. And in 'Azhagar Kovil', the pride goes to "Azhagar Kovil Dosai". I needed an authentic recipe for this prasadam. I got this recipe from a 'Kainkaryaparar' (one who serves the Lord) of the temple.The 'Kainkaryaparar' says, "Azhagar Perumal takes care of Himself and His needs and there is nothing as a man does something for HIM". The spring is said to have medicinal values, and taking bath in this cures many diseases. Water for temple usage, such as 'Tirumanjanam', 'Thaligai' etc. is only from this spring. He also says, "It is because of this water the temple prasadams have a distinctive taste". Unlike other temples, this dosai is cooked in a "Panchaloha" (Aiympon) tawa, a special utensil ('Thirumeni of Perumal' is also made of the same Panchaloha) which is a giant-sized dosa pan, shaped as an 'Adai Madakku' measuring around 2 feet in diameter and 3" height. 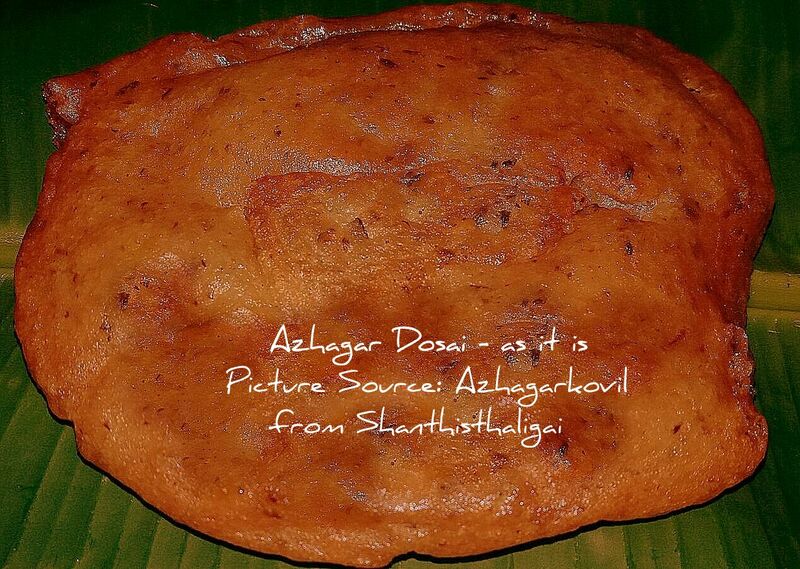 'Azhagar Dosai' is cooked and deep fried only in ghee. No oil is used for prasadams. The batter for 'Azhagar dosai' is prepared in the morning and offered to Perumal in the evening. After the offering (Neivedhyam), the dosai is torn to pieces and distributed alongwith vadai and karuppu kondakkadalai sundal to the 'Goshti' (a set of people who sing hymns). This prasadam is called "dosai podi". Only one dosai is prepared a day. However, during festivals, many will be in the 'Goshti', so dosai is prepared according to the need in distributing to the 'Goshti'. This dosai which is almost 1 1/2 feet in diameter and 2" thick, never goes to the prasadam counter. Small sized dosas are prepared and sold to the bhakthas who come to the temple, which is NOT from the Madapalli. An extra bit of information which I read few months ago, Dosai is said to be one among the 4 appams told in ancient tamil literature, and the shape which we make came into existence much later. This temple is known for its antiquity and the azhagar dosai looks more like an appam. Coming to the recipe (Source:Azhagarkovil), the measurements were given in 'padi' and I am posting in cups for easy reference and preparation. Par boiled rice is NOT used in the 'Thirumadapalli' of temples. All temple prasadams are made with raw rice only. Ghee, Pepper and Jeera are used generously. NOTE: This dosai will NOT be soft as the regular dosa. As all Perumal kovil dosais are made with raw rice, these will mostly be thick and hard to swallow. When made thick, this dosai is crispy outside and soft and grainy inside and also tastes good. This is a deep fried home style Azhagar dosai. The original recipe calls in for ghee to deep fry, but I deep fried in oil. Wash and soak rice in water for 2 hours, drain the water completely and dry in a cloth. Wash black urad dhal and soak for 4 hours. Grind it with skin to a smooth, thick batter. Coarsely grind pepper and jeera and keep aside. When rice is dry, powder it into fine flour and combine with the urad dhal batter. If the rice flour is not fine, you can sieve it. Add chopped curry leaves, pepper-jeera powder and salt. Mix well. Allow it to stand for a couple of hours. Its fine if you allow it to stand for 4 to 6 hours. Heat an adai madakku, fill it up with ghee, pour the batter and spread into circles thicker (1/2" thick) than the regular dosas. Flip and deep fry on both sides until golden brown. Serve hot. Below is the low calorie version of home style Azhagar dosai, compared to the above, but with generous oil. Same method as above, spread in a tawa and drizzle generous oil on all sides. You can also spread as regular dosa. Congrats on your blog anniversary, heard so much about these dosais, bookmarked the recipe, going to try it soon..
could feel the divinity. will surely try. Let me at the outset extend my Hearty Congratulations on the completion of seventh year by your blog.A great milestone considering its huge number of footfalls signifying its popularity and the amazing variety of delicacies dealt with. I hear about Kallazhagar dosai first time and that dosai is being fried deep in ghee.It looks more like appam!Thanks for sharing all the information. congrats!!! 7 years is awesome achievement !!!! Congratulations on the completion of seven years of blogging. Thanks for sharing the devine information and the prasadam Recipe. Superb shanthiji, i tried this dosa, it came out so well, thanks to god and to you for giving this recipe. Posting the recipe in my kitchen, with proper linkbacks here. Thanks again!! !